Plains sunflower (Helianthus petiolaris) is an annual plant that responds quickly to bare ground in the Nebraska Sandhills. They pop up after fire, intensive grazing, pocket gopher activity or something else allows light to hit the soil. At times, they can be widespread, as they were the year after the 2012 drought. More often, they are found scattered about the prairie in patches of sparse vegetation. They have started to bloom in earnest over the last couple of weeks, adding beautiful accents to the summer prairie. Last week, I spent an hour photographing sunflowers and the wide variety of small creatures I found hanging about on them. In just one hour, I spotted a pretty incredible abundance and diversity of invertebrates within an area smaller than my backyard. 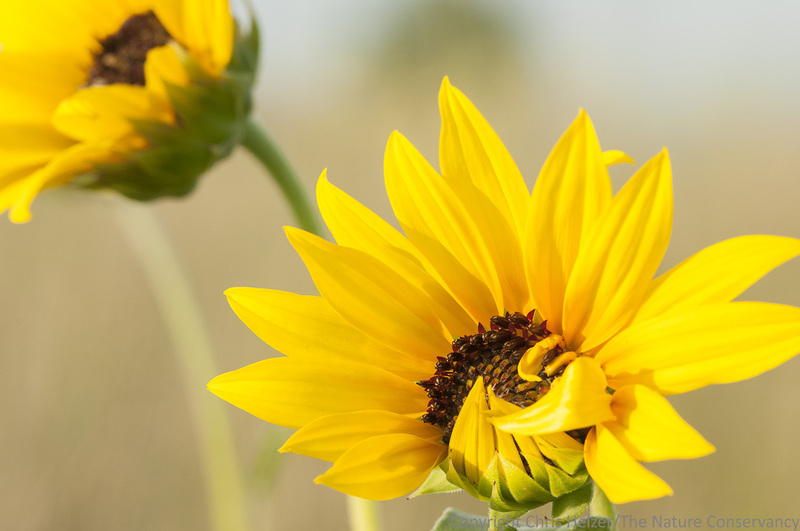 Sunflowers, especially annual sunflowers, are considered by some to be weeds, but these native wildflowers play really important roles in prairie ecology. Their seeds are extremely valuable as food sources for many wildlife species and their young leaves and flower buds/blossoms are quality forage for other species, including cattle. During this time of year, the abundant and accessible pollen and nectar of the flowers is what seemed to be attracting the invertebrates I saw. Here is a selection of photos displaying some of those sunflower visitors. A variety of grasshopper, katydid, and tree cricket species are all commonly found feeding on the flower parts and pollen of sunflowers. Weevils, long-horned beetles, and other beetles are also frequently seen. Weevils and other beetles (including the one at the top right of this photo) were also present on many of the sunflowers I saw. Wasps, like this paper wasp, were crawling around the stems and leaves of the sunflowers, apparently gathering extra-floral nectar that was also attracting abundant ants. The abundance of herbivores, pollinators, and other insects on the flowers and vegetation of the sunflowers seemed to attract a number of predators as well, including robber flies, spiders, and assassin bugs. A robber fly perches on a flower bud. It was hard to see for sure, but I’m pretty sure this assassin bug was feeding on an individual of the same Perdita bee species shown above. I hope these photos, all taken from a small area and within a short time period, help illustrate the kind of resource annual sunflowers can be in the Sandhills. I’m sure many other wildflowers host similar numbers of invertebrates, but the height and conspicuous nature of sunflowers make it really easy to see and appreciate their value. Annual sunflowers aren’t aggressive – they just take advantage of open soil and available root space. As vegetation recovers from whatever event caused it to become sparse, sunflower abundance diminishes…until they get another opportunity to pop back from seeds and make their contribution to the prairie ecosystem. There are a few subjects I can’t seem to keep from photographing. Milkweed seeds, for example. Patterns of ice on frozen wetlands. Dew-covered insects. And sunflowers. What flower is more distinctive? Their bright yellow color and big round flowers stand out, even in the most showy of flowery prairies. Insects seem to find stiff sunflower attractive too, based on the number of insects I’ve found and photographed on them. Plains sunflower (Helianthus petiolaris) in restored sand prairie. The Nature Conservancy’s Platte River Prairies, Nebraska. We’re fortunate to have seven different species of sunflower in our Platte River Prairies, five of which are perennials. The above photo is of one of the two annuals, plains sunflower, which inhabits the drier sandy uplands of our sites and is very abundant in the Nebraska Sandhills to our north. I have plenty of sunflower photos I like, but this is one of my favorites from last year. I like the overall composition, but I also like that the sunflower in the foreground is atypical. Something has prevented the petals (ray florets, for you botanists) from developing completely. It’s interesting (and not unattractive), and also stimulates questions about what happened, and why.